10 a.m. Advance party of 3 set off for Leenaun. The long awaited attack on the Bens, Mweelrea and the Turks was underway. A good start, 2 hours into the weekend an emergency stop in Claren Bridge for one hungry member of the party. The first of two dinners that day. On with the reccy, all parking at start and finish points were sussed out and it was a weary trio who got the Leenane Hotel after 6 pm the meet up with the remainder of the party. 6.30am rise with a 7.30 breakfast and by 8.30 we were away. The climbing commenced at 10 a.m. 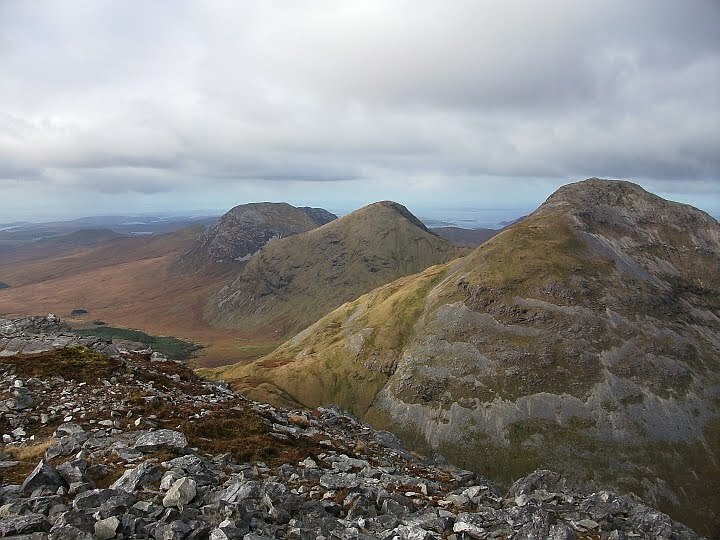 The Glencogan Horseshoe, the best in Ireland beckoned. With just a few exceptions this was new ground to the group. Leaders with fingers crossed that what was studied on maps corresponded with the ground. No need to worry, with sun and great visibility it was a doddle. The views were fantastic (no need to go abroad for the scenery). And with scree slopes like the Alps, it was a happy crew who returned 15.5 km, 1450m & 7.5 hours later for our gourmet meal and a few pints of water! A pleasant evening followed. An attempt to reduce numbers by selling of some of the party failed. Woke to some very nasty weather so Plan B kicked in. Up what is known as The Ramp near to Doo Lough and on to Ben (the) Bury a 795m.. A good 5 hours later, back by the famine monument. A few enthusiastic (fanatical) decided they were not wet enough, so on to the Diamond, Hill near letterfrack. Too much for the rest who retired to Gaynors pub (of The Field fame). While here, our matchmakers struck lucky with a big local sheep farmer, our thrilled maiden was over the moon. However it proved to be a short lived affair as the sheep farmer failed to show later in the evening. We were delighted though, to learn the following day, that there was a good reason the bride-to-be was stood up. The excitement was too much for Farmer Joe, he expired that evening. Day 3, packed up and ready to go at 9; climbing by 10. The first section of the Mammturks, it was strange to climb Corcoge in daylight (easier in the dark when the top cannot be seen) the occasion was too much though for a few who thought they were on the challenge. Not a bad day, great views. Sun, rain and wind rounded off the weekend 4.5 hours later. Back in Cork at 10.30pm all safe, sound & sober! In summary thanks to entire group who contributed to a wondetful weekend, relishing the early starts and the sessions after even more. Victor Hurley and Pat Broderick.